Introducing the first residences at Hudson Yards, designed by Diller Scofidio + Renfro in collaboration with Rockwell Group, Fifteen Hudson Yards’ 88-story tower features an elegant silhouette just steps away from Vessel, the monumental design centerpiece on the Public Square and Gardens by Heatherwick Studio. Formed by four graceful arcs of glass, the building boasts a premier location on the High Line and is adjacent to The Shed – New York’s forthcoming center for artistic invention. Fifteen Hudson Yards offers a distinctive living experience – tailored design with five residence types and two design palettes, unparalleled amenities, a gracious lobby located directly on the Public Square and Gardens and breathtaking Hudson River views – all just moments from the creative energy of West Chelsea. The extraordinary lifestyle of Fifteen Hudson Yards extends beyond individual residences. The 50th floor, which is entirely dedicated to wellness pursuits, includes 12,000 square feet of spa, salon and fitness facilities. One floor up, the 51st floor is a resident gathering space, with lounges, private dining suites, a club room, and a state-of-the-art collaborative work space. For more information, please visit FifteenHudsonYards.com and also take the new virtual tour of Penthouse 88B. Standing over 900 feet high, Fifteen Hudson Yards offers a sanctuary above the bustle of Manhattan. Fifteen Hudson Yards is accessible directly from the Public Square and Gardens. Residences boast five distinct residence types all with exceptional finishes and dramatic views. Residents can select from two interior design palettes at Fifteen Hudson Yards. Bathrooms utilize neutral tones and top-tier materials. 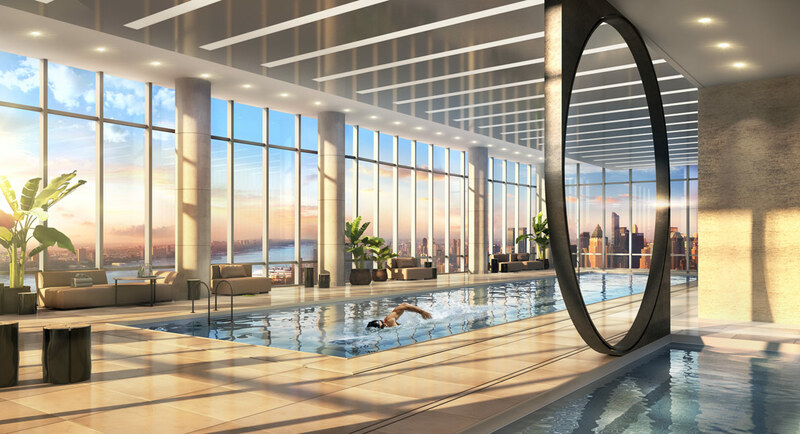 Fifteen Hudson Yards offers an entire floor dedicated to health and wellness. The wine tasting room is one of many state-of-the-art amenities at Fifteen Hudson Yards.